What appears to be a hidden gem from the outside is actually a restaurant that everyone in town seems to know about. 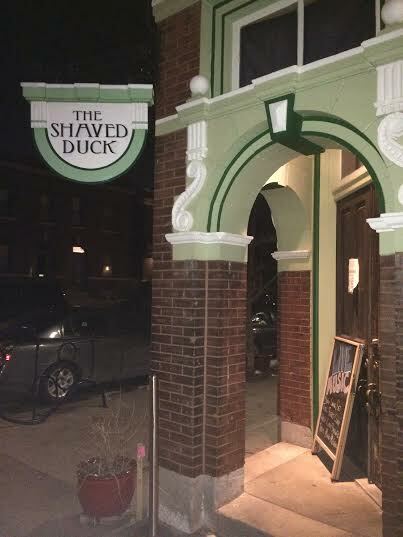 The Shaved Duck was completely packed, even on a Friday during Lent when it seems many people would shy away from a restaurant that prides itself on BBQ. We pushed our way in the door where we began our hour and a half wait for a table. We managed to get a drink while we waited and we were able to follow our wait on the NoWait app (although you are not able to reserve a place in line ahead of time). When we were just reaching our limit of standing shoulder to shoulder with strangers, dishes of much appreciated, seasoned popcorn were brought out and placed at the bar for everyone to munch on. We were finally seated in the dining room which had a great, energetic vibe. We looked over the menu and decided on appetizers to share between our table of four. First up was the buttermilk cornbread served in a skillet with a side of honey butter which the menu stated would take 15 minutes to prepare. However, it arrived in no less than 5 minutes, barely warm, and slightly dried out which can only mean that it had been sitting there a while. The sweet glaze on top and butter definitely helped but in the end, it was only average. Our second appetizer was the smothered fries which were featured on Diners, Drive-ins, and Dives. They were topped with rib and pork meat, white cheese sauce, and sharp cheddar. I really enjoyed the white cheese sauce verses the typical nacho cheese you find at most places and the plate was perfect for four people to share. While the fries were good, I can’t say I was blown away by them. I had the shrimp and grits for my entrée. This hearty bowl of rich and creamy grits was topped with five large shrimp and while there were no frills about it, the dish was delicious. We also had the chance to sample one of the four chilies on the menu. We ordered the ancho beef as a chili mac meaning that the chili is served over a bowl of macaroni and cheese creating a dish that is definitely large enough to be ordered as an entrée. This was the least spicy of the chilies and was definitely manageable (the spiciest is served with a glass of milk). After hearing about the house-smoked meats and homemade sausage and meatloaf, two sampler platters were ordered at our table. The first had pulled pork, pulled chicken, and mac and cheese while the second had meatloaf, pulled pork, and burnt ends. While both plates were completely licked clean, the burnt ends were voted to be the favorite and the meatloaf was said to be “better than moms” (sorry Mrs. E.). Just when I thought I could not eat another bite, we managed to be temped with dessert. After all, who can resist Samoa white chocolate pretzel bread pudding? Unfortunately, it was a little dry and we all agreed that the gooey butter brownie might have been a better option. While there were parts of our meal that I didn’t love and the wait was less than desirable, I understand why the restaurant is bursting at the seams. The atmosphere and energy of the restaurant make for a really great dining experience. It is evident that a lot of time has gone into creating a menu full of thoughtful comfort food that keeps people coming back.